Victoria Square Dome is a commercial and leisure development forming the biggest and most expensive property development ever undertaken in Northern Ireland. This development alone instantly grew Belfast’s retail sector by 33%. The shopping centre consists of 70 shops, 800,000 sq ft of retail space, 150,000 sq ft of leisure facilities including a cinema, restaurants and 100 luxury apartments. 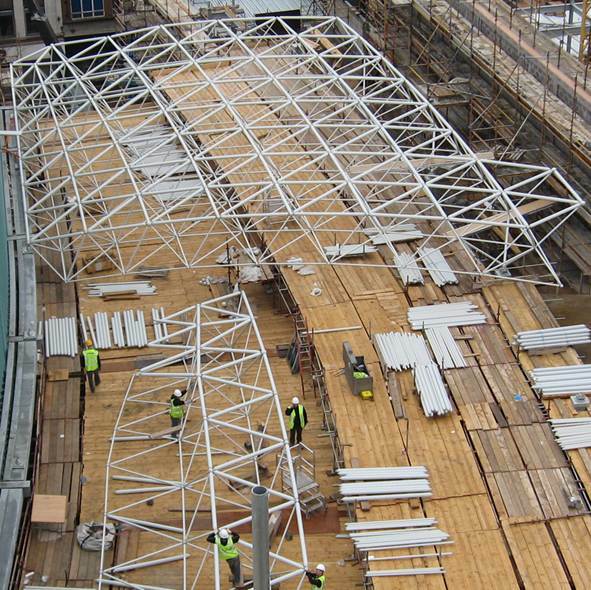 PHD were tasked with providing the access requirements to install the glazing of the massive 35 metre diameter roof. A crash deck platform was formed following the contours of this unique structure using specialist modular equipment. PHD’s access solution enabled efﬁcient glass installation whilst at the same time creating a safety barrier to those working below. The glass in the dome is Sedum based to reduce the buildings carbon footprint. This process allows the roof to soak up rain water leading to natural evaporation over time, rather than running the potential risk of overloading drainage systems. Victoria Square is regarded as one of the most iconic buildings of the Belfast City skyline showcasing its cutting edge engineering.